It started around 3pm last Friday so I decided to leave work early and head straight home. Since then, I did not leave our place until around 10pm earlier when I went down for a massage. I don’t know about everyone else but I just don’t like this feeling at all. My body clock is all messed up again because I’ve been sleeping a lot and I cannot seem to concentrate on any task… I even find it hard to finish a PSP game. Oh man, I just wish I’d feel a little better when I wake up later so I can at least go to work and actually get something done there. Also, I really want to attend the fellowship with my SFC family. This is the title of one of my favourite songs and, although I knew people who moved around more than I did, I am able to relate to this song because I had a hard time dealing with change as a kid. Moving from our province to Manila for grade school, to Jakarta for high school and then back to Manila for university was not really easy. However, this experience allowed me to become more flexible to changes. This is probably the reason why I enjoyed the Change Management class I took a couple of years ago, because I know and appreciate how difficult it is to implement and manage change. I guess this is also the reason why I usually go out of my way to communicate changes to everyone, and why I appreciate leaders who take the time to do so. In the same way, that is why I do not like people who simply force new things down people’s throats. Why couldn’t we keep time from movin’ on? Hold on to all the years before this moment’s gone? Hopefully, my grade will increase once I go back home on September. For one, I have already booked flights to go to Camiguin for a family reunion. I am also planning a couple of other trips to the “usual” tourist destinations that I have not been to… Let’s see how that pans out! How about YOU? How much of the Philippines have you visited? Find out at Lakbayan! And let me know… trying to get some comments going on here. Hint! Hint! Hahaha! Sir, is there an emergency? Wow! This was how polite the officer was when he pulled us over. Yes, yes.. I was actually pulled over by the cops for SPEEDING! I am sure Milo (my roommate in Austin last year) would be surprised. I was always the one telling him to slow down and here I am, being pulled over for being 20mph over the limit. Apparently, I was driving in a school zone and a little over the limit can already get someone into trouble. I was really feeling weak and uneasy. I have never been pulled over in my life and it had to be here. Here were you cannot bribe the cops and here were I was pretty sure that I had just wasted at least 2weeks worth of allowance to pay the fine. Oh man, it was just not my day, or week for that matter. I have been going through a lot of stress lately and I just did not need any more problems. 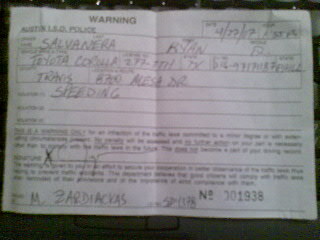 But, it actually turned out to be my lucky day b’coz the officer decided to let me off with a warning! Oh man! I was so relieved. I guess God thought I’ve had enough for the week. 🙂 I say this b’coz I found out from my colleagues later on that speeding near a school zone is a pretty serious offense. Whew! Thank you, Lord! I just want to rant, so bear with me. It just annoys me when people post poems, lyrics and essays on their blogs without putting in their thoughts. I just don’t get it.. but then again, to each his own.